In January 1991, eight members of the SAS regiment embarked upon a top secret mission that was to infiltrate them deep behind enemy lines. After a fierce fire fight, they were forced to escape and evade on foot to the Syrian border. In January 1991, eight members of the SAS regiment embarked upon a top secret mission that was to infiltrate them deep behind enemy lines. Under the command of Sergeant Andy McNab, they were to sever the underground communication link between Baghdad and north-west Iraq, and to seek and destroy mobile Scud launchers. Their call sign: BRAVO TWO ZERO. Each man laden with 15 stone of equipment, they patrolled 20km across flat desert to reach their objective. Within days, their location was compromised. After a fierce fire fight, they were forced to escape and evade on foot to the Syrian border. In the desperate action that followed, though stricken by hypothermia and other injuries, the patrol 'went ballistic'. Four men were captured. Three died. Only one escaped. For the survivors, however, the worst ordeals were to come. Delivered to Baghdad, they were tortured with a savagery for which not even their intensive SAS training had prepared them. 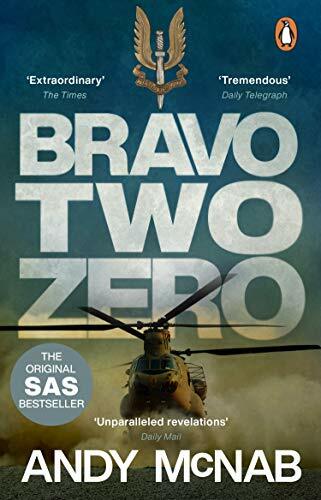 Bravo Two Zero is a breathtaking account of Special Forces soldiering: a chronicle of superhuman courage, endurance and dark humour in the face of overwhelming odds.